"Everyone has a story to tell"
European Press Critically Exams the Dalai Lama and Kalachakra Rituals While the American Press Naps in Washington, D.C. I just ran across a press release that gives some vital information on the Kalachakra Initiation that is occurring in Washington, DC. Here it is. It provides very critical insights on what appears to be happening in Washington, DC. Hope you find it of assistance. ‘The Kalachakra Initiation in Washington DC is the one of the largest and most spectacular events Tibetan Buddhism ever has performed in the West. Nearly all high ranked Lamas are present from around the globe including the young Karmapa, who seemingly is being billed by the D. L. as his spiritual successor. So estimate that 100.000 participants will be attending the Kalachakra ceremonies over the ten day period (July 6-16,2011) including some high ranking political figures.’ Although the Dalai Lama recently resigned from his position as King of the Tibetan-Government-in-Exile and boasts of “separation of Church and State, he has already had political meetings with US top politicians including Speaker of the House John Boehner, Minority Leader Nancy Pelosi (CA), and several other representatives. Press release of the Critical Forum Kalachakra. A Ritual of Peace or a Totalitarian Temptation? Included in the Kalchakra Tantra are: the construction of a so-called Sand Mandala, which symbolizes the cosmos, an apocalyptic prophecy known as the Shambhala Myth, and several top-secret initiations. But are the Kalachakra Tantra and the Shambhala Myth truly pacifist? Do they really encourage harmony and cooperation among people? Do they make any real contribution to freedom and justice, equality of gender, religious tolerance or ethnic reconciliation? Are they a comprehensive, politically humanist, democratic and non-violent contribution to world peace? Andrei Znamenski is not alone in this assessment. The Kalachakra Tantra and Tibetan Buddhism are coming more and more into focus by critics. (See: Critical Links to Lamaism) In their groundbreaking work The Shadow of the Dalai Lama – Sexuality, Magic and Politics in Tibetan Buddhism, German cultural philosophers, Victor and Victoria Trimondi, not only provide surprising, previously ignored research but also undertake a well-founded interpretation of Lamaism, rendering the Tibetan-Buddhist worldview understandable for Western readers through a comparison with European religious traditions. The text pays particular attention to an extensive analysis of the Kalachakra Tantra and its political, ideological, and spiritual implications. (The book appeared in 1999 through the reputable German publishing house Patmos Verlag. The English version is online. It became the standard work on the critical examination of Lamaism and the metapolitics of the Dalai Lama. In the eighties Victor Trimondi did support the Tibetan religious leader, organized several international congresses and other events with him and featured books about him in his own publishing house, the Dianus-Trikont-Verlag.) In their book the two authors describe in detail the secret rituals of sexual magic in the higher initiations of the Kalachakra Tantra (The Public and the Secret Initiations); they have shown the religious-political intention of the Tantra to establish a world-wide Buddhocracy with a sacred world-ruler (The ADI Buddha); they discuss the intolerance of the Tantra vis-à-vis the monotheist religions, its militant and aggressive warrior-ideology, and its vision of a religious end-time battle against Islam (The Aggressive Myth of Shambhala); and they show how the Tantra is interpreted by the Dalai Lama spokesman Robert Thurman as a symbolic and meta-political instrument to conquer western culture by Lamaism (The Buddhocratic Conquest of the West ). The Trimondis came to very similar conclusions as their American colleague Andrei Znamenski and other critical authors on the topic: “The teachings of the Buddha have so many treasures and wonderful insights, but the philosophy, the vision and the practices of the Kalachakra Tantra are neither compatible with fundamentals of Buddha’s teachings nor with basic principles of Western Enlightenment. Therein are included an apocalyptic war of religion, the aggressive application of super-weapons, radical transgressions of a humanistic moral code, the dissolution of the ego and the soul of the participants of the ritual, the totalitarian subjugation under the will of the guru, the idea of an imperial and global lama-state (Buddhocracy), and the concept of an absolutist world ruler, the Chakravartin. The two German cultural philosophers created the Critical Forum Kalachakra to open a wide-ranging debate over the hidden “dark sides” of the Tantra, and published many other articles, including a pamphlet, Eight Questions to the 14th Dalai Lama on the Topic of the Kalachakra. During the public Kalachakra Initiation in Graz/Austria directed by the Dalai Lama (2002), the German-speaking media picked up these critiques from the Trimondis and other authors to discuss the controversial ritual. The Austrian state TV & Radio ORF broadcasted a feature called, “Critique of the ‘Peace Ritual’ of the Dalai Lama in Graz.” ‘Peace Ritual’ has been written in quotations marks to emphasize the ambivalence of the term in this context. In the meantime, dozens of books, articles, and discussion groups in German and French have carried forward these criticisms and have expanded them–without sparing the person of the Dalai Lama. A lot of the critical voices came also from the Buddhist camp. See, for example, comments to an article about the Kalachakra Initiation 2011 in the Huffington Post. The latest high point of this critical wave in Germany was a cover story in Germany’s biggest magazine “Stern” (2009): The two faces of the Dalai Lama – The soft Tibetan and his undemocratic Regime (trans. in English). This article was written by Tilman Müller, the same journalist who uncovered ten years before–with his Austrian colleague Gerald Lehner–the Nazi past of the Dalai Lama’s teacher, Heinrich Harrer: Dalai Lama’s friend: Hitlers Champion (trans. in English). Their sensational discovery caused a protest movement in the Jewish community against the film adaptation of Harrer’s autobiographical book Seven Years in Tibet, with Brad Pitt as Harrer. Very accurately the historian Andrei Znamenskis calls the Kalachakra Tantra “a totalitarian temptation.” In his book Red Shambhala he recounts the story of political and spiritual seekers from West and East who used the Tibetan Buddhist prophecies of the Kalachakra Tantra (the Shambhala Myth) to promote their spiritual, social, and geopolitical agendas and schemes. Red Shambhala proves that people in the Left were no strangers to the occult, and they were equally mesmerized by the Tantra. But even more mesmerized have been people of the far Right. In their second book, Hitler-Buddha-Krishna – An unholy alliance from the Third Reich to the present day (2002) which received international attention, Victor and Victoria Trimondi show how influential Fascists and Nazis used the philosophies, mythologies, visions, and dogmas as well as the religious practices and texts of the spiritual traditions of Asia for glorifying war, and for the deification of the “Führer” and the white race. Some of them have been electrified by the Kalachakra Tantra and the Shambhala-Myth. The Trimondis uncover how the Nazi-Orientalists who prepared the SS Tibet Expedition of Reichsführer Heinrich Himmler have been interested in the ritual, and how members of the SS Ahnenerbe (the brain trust of the SS) wanted to spare the Kalachakra Temple in Leningrad (St. Petersburg) during the siege and barrage of the city by the Deutsche Wehrmacht (1941 – 1944). 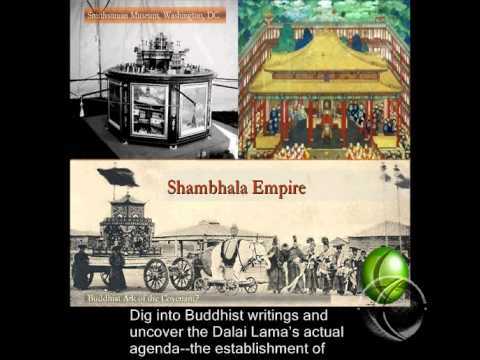 The Shambhala Myth of the Kalachakra Tantra and its militant ideologies are a topic in the occult literature of the international Neo-Fascist and Neo-Nazi scene. One example is Miguel Serrano, the recently deceased leader of the Chilean National Socialists. Another example is the accredited expert on the Orient (and Hitler admirer) Jean Marquès-Rivière who after WW II was convicted in absentia and given the death sentence for turning Jews and Free Masons over to the Gestapo and SS in France. He was the author of a Kalachakra interpretation once popular with some fascist elements. He wrote in his book that the Dalai Lama personally gave a ring to him with the Kalachakra Emblem to demonstrate that he is part of the inner circle of Shambhala adepts. (Kalachakra: Initiation Tantrique du Dalai Lama) Last but not least, the Japanese Doomsday Guru, Shoko Asahara must be mentioned. He intended a Shambalization of our planet by means of nuclear terror. Asahara was responsible for poisonous gas attacks on Tokyo’s metro in 1995, killing 12 and leaving hundreds injured. The terrorist sect’s leader met the Dalai Lama on several occasions. Even weeks after the first assault, the Dalai Lama called him a “friend, yet not a perfect one.” Only later did the Dalai Lama distance himself from the sect leader. (The Doomsday Guru Shoko Asahara and XIV Dalai Lama). A statement from the Capital Area Tibetan Association, which is putting on the event, also stressed the significance of having it in Washington: “If there is a seed of spirituality in this very city, that seed when it grows is bound to have an effect.” The ritual is to be carried out in the Verizon Center approximately mid-way between the White House and the US Capitol Buildings, just a short stroll from the National Mall. Yes,10 years after 9/11! But what did happen exactly ten years before 9/11? In 1991 in New York City a so-called Kalachakra Sand Mandala was constructed, then destroyed by the Dalai Lama, and the sand was poured into the water near the World Trade Center. Two years later in 1993 another Wheel of Time (Kalachakra) Sand Mandala was built by Tibetan Monks in the lobby of Tower One. For over thirty days, many of the World Trade Center workers and visitors were invited to participate during the construction of this Mandala. Although these coincidences may be accidental, they prove that these two Kalachakra events were not a remedy for “national debt, wars, environmental disasters and terrorism.” If they did have any magical effect at all, it was to produce exactly the opposite. You will find a résumé of the most problematic contents of the Kalachakra Tantra with original citations under: Critical Forum Kalachakra. The English site of the “Trimondi Online Magazine” under: www.trimondi.de/EN/front.html and the book “The Shadow of the Dalai Lama – Sexuality, Magic and Politics in Tibetan Buddhism” under: www.trimondi.de/SDLE/Index.htm Critical Forum Kalachakra.